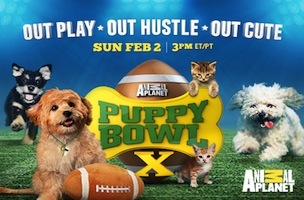 Don’t forget that this Sunday before the big game is the Puppy Bowl on Animal Planet! The “game” is two hours of watching adorable puppies play on a fake football field. They relay that same game 6 more times Sunday so you can catch it after the real football game if you don’t get a chance before. If you would like to read some more interesting facts about Puppy Bowl check out CNN’s article 66 Adorable Reasons to Watch Puppy Bowl.